Thomas, the son of Solomon and Rachel Mugridge, was baptised in Ashburton in February 1765. Solomon Mugridge and Rachel Luscombe, a widow, both of the parish, had married the previous year - Solomon had been able to sign the register. Tho. Mugridge, possibly the Thomas above, was a boot and shoemaker in the Universal British Directory of Trade, Commerce and Manufacture, Vol 2, late 1700s. In the same volume Rachel Mugridge was a haberdasher. The banns for Thomas Mugridge and Jane Edye Shepard were published in December 1797. Thomas came from Ashburton and his bride was from the parish of Stoke Damerel. A January 1834 notice in the Sherborne Mercury may be connected with the family: all persons having claims on 'Thomas Mugridge and his late sisters, Co., partners, shopkeepers' were to contact 'the said Thomas Mugridge' by the 28th of the month. If this is Thomas the son of Solomon and Rachel, his sisters could be Eliza (bpt 1767) and Sarah (bpt 1774). Sarah Mugridge (?) aged 57* was buried on November 15th 1833 and an Elizabeth Mugridge aged 66 was buried in Ashburton a fortnight later. *The age is slightly incorrect if this is the same Sarah. Thomas was 79 when he was buried in 1844. Thomas Mugridge of Ashburton is named in the Death Duty registers of that year, with Jane Edye (could be Edge) Mugridge as executor. Jane E Mugridge herself features in the Death Duty registers in the following year: Hugh Mugridge, of St Pancras, is her executor. Hugh Mugridge, the son of Thomas and Jane, was baptised on the 20th May 1807. He married Fanny Gard in the December quarter of 1838, in the Newton Abbot registration district. The couple were in Marylebone when their son John Gard Shepheard Mugridge was born in 1844, but his baptism was in Ashburton. Their residence was given as St Mary le-bone, London, and Hugh's occupation is cabinet-maker. They were back in the Newton Abbot district when Henry Gard Mugridge was born in 1848. John Gard Shepheard Mugridge was buried, aged 6, in October 1850. There are 7 other burials on the same page of the register, between September 27th and October 11th, and all are of young people: the ages are: 16, 18 months, 6, 7 months, 9, 6 and 2. This suggests to me that there may have been an infectious disease in the parish. Fanny was born in 1852, also in the Newton Abbot district. 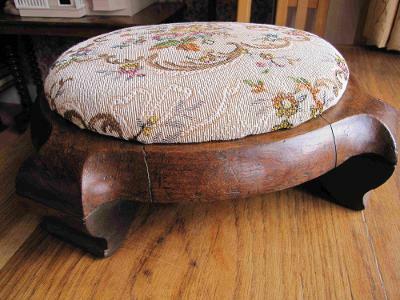 Above: A footstool made by Hugh Mugridge. See the 1850s section of the Virtual Museum for more on this. By 1851 Hugh is living in West Street with his wife, Fanny, and his mother-in-law, Elizabeth Gard. Hugh and Fanny have a two year old son, Henry Gard Mugridge, and Hugh is a cabinet maker. Hugh and Fanny are in Newchurch, Isle of Wight for the 1861 census; their 8 year old daughter Fanny is with them. Ten years later the couple are back in West Street with their son, who is also a cabinet maker. In 1889 some delapidated buildings in West Street, opposite Messrs Watts, Whidborne and Co.'s bank, were sold to Mr Henry Stevens for £145. Mrs Fanny Mugridge and others were living in the property. Later that year the buildings, 'late the property of the representatives of Hugh Mugridge' were torn down. During this work James Bowden and John Warren found the remains of an infant wrapped in canvas under the flooring of one of the rooms at the back. P S Nott was informed, who called in Drs Gervis and Fraser. They concluded that it was a fully developed child, probably hidden about 20 years previously. Henry Gard Mugridge married Lavinia Cornish in the St Germans registration district in 1877, and a son, William Henry Cook Mugridge, was baptized in Ashburton the following year. Henry Gard's occupation is that of cabinet maker. Henry Gard Mugridge is living in East Street in the 1911 census, next to William Henry Cook Mugridge (see People and Properties 1900s). Both are cabinet makers. Hugh had at least 4 siblings: Thomas Shepherd Mugridge (bpt 1799), Solomon (bpt 1803), Mary (bpt 1805) and Jane (bpt 1810). Thomas Shepheard Mugridge married Letitia Wills in Bovey Tracey in November 1825. In the following 5 years they had at least 3 children: Thomas Shepheard Mugridge (jnr), baptized in 1827, Solomon Wills Mugridge, baptized 1829, and Philip baptized in 1830. Thomas S Mugridge, aged 51, is in East Street at the time of the 1851 census, with his wife Letitia and children Hugh, Lavinia and Joseph. Thomas is a cabinet maker. The previous year Thos. Shephard Mugridge, jun., late of Ashburton, married Miss Creek* of Ashburton at St Pancras Church, New Road, London. They have a 4 month old daughter, Eliz., and are in St Pancras for the 1851 census. Thomas is a cabinet maker. In 1881 Fanny Mugridge, aged 29 and born in Ashburton, is at Chappells Pianoforte Factory, Belmont Street, St Pancras. She is in the household of her 53 year old cousin Thomas J Mugridge, a pianoforte maker employing 109 men and 20 boys. Thomas was also born in Ashburton, and may in fact be Thomas S[hepheard] Mugridge jnr. 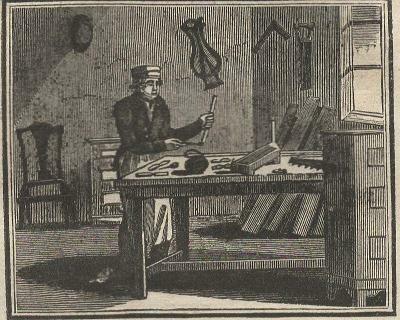 Solomon is a wheelwright in 1841, in the household of Henry and Jane Kingwill in North Street. He is an annuitant by 1851, when he is living in North Street with his sister, Jane Kingwell. Jane, a widow aged 40, is a linen draper and grocer.